The perception of time as a ray stationed on a linear axis is supported by the notion of there being a fixed, infinite future. 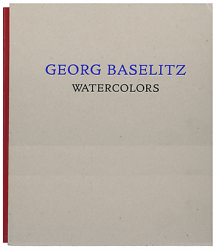 Following this logic, we are quick to place these new watercolors by Georg Baselitz at a point near the later half of his career. But to understand his Remix series, one must reject this pedantic impulse. In a catalogue essay accompanying Baselitz's traveling Remix series, art historian Richard Schiff explains that Baselitz "developed few illusions with regard to the order of history that surrounded him." Having come of age in a Germany churning in the debris of the Second World War, Baselitz is of a generation detached from linear thinking. A psychological casualty, his personal history resembles more of a helix than a flat ray. His new watercolors are not so much remakes of original pieces as they are semblances of new memories, new motifs, and new interpretations: clarified, condensed… rhapsodic. This Remix series is purposefully self referential; a challenge to his own vision and vocabulary, it pushes at the boundaries of his practice as a painter. In his essay introducing this exhibition's catalogue, Klaus Kertess, who has written on Baselitz since his second painting exhibition in New York in 1984, asserts: "Baselitz has dared himself to let go- really let go, risk still more…[in] these escalated storms of liquidity." Rendered in featherpen and watercolor, as opposed to the heavily applied oil paintings for which he is so well-known, his new works approach the original subjects with the theoretical and formalistic concerns of a draftsman. The composition is reconsidered, broken down into new shapes, weights, positive and negative spaces. The washes, applied as bursts of primary color between strong black lines, do not sit heavily on each other. A new space is born. The dynamic, confident flicks of his racing feather pen are spirited, gestured-- more entertaining than instructionally mournful. But then, the whiteness of the roomy canvas feels more empty than usual. The work has a new distance; perhaps in the inventive act of remixing, some things are forgotten. But it is here, in these physical spaces that Baselitz allows himself to be vulnerable again. Georg Baselitz was born in 1938 and currently lives in Munich, Germany. Works from the Remix series have been included in recent museum exhibitions at the Pinakothek der Moderne in Munich and the Albertina Museum in Vienna.